The csrss.exe file, which shows up in Task Manager as Client Server Runtime Process, is an essential part of Windows. You never interact with it directly as a user, but it does perform some very important functions in the background, whether you use Windows 7, Windows 8, or Windows 10. Under normal circumstances, the csrss.exe file isn't malware or a virus, which means you can't safely delete or quarantine it. However, there is an easy way to verify whether you're dealing with the actual csrss.exe or an imposter. If you do find that your system has been infected with malware pretending to be csrss.exe, then the best course of action is to remove it. What Is Client Server Runtime Process? 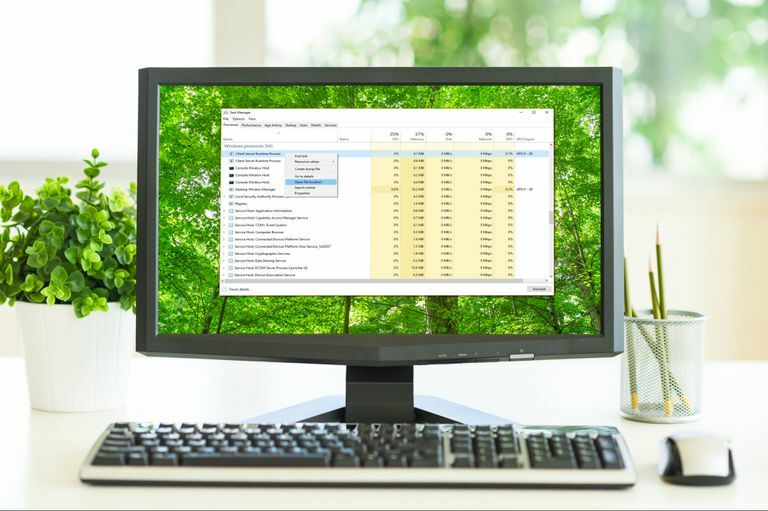 When you open the Task Manager on any Windows computer, you'll find at least one instance, and often several instances, of something called Client Server Runtime Process. This is the display name that Windows uses for csrss.exe, which actually stands for client server runtime subsystem. The Client Server Runtime Process has been around since the early days of Windows. Prior to 1996, it was actually responsible for the entire graphical subsystem. That use has changed throughout the years, but it's still responsible for some extremely critical work behind the scenes in Windows 7, Windows 8, and Windows 10. Is It Safe to Disable Csrss.exe? Even though csrss.exe has limited functionality in modern versions of Windows, compared to obsolete versions, it's still critical. That means you can't kill, disable, delete, or quarantine csrss.exe without experiencing severe consequences. If you kill a legitimate csrss.exe process, your system is likely to become unstable. In most cases, your computer will even shut down. The computer will typically start up just fine afterwards, but deleting or quarantining the file itself may result in a computer that is unusable without professional intervention. What Causes Csrss.Exe to Use Excessive GPU or CPU? Under normal circumstances, csrss.exe should only use a minuscule amount of system resources. If you open Task Manager and see an instance of Client Server Runtime Process using an excessive amount of system resources like CPU, GPU, or memory, that usually indicates that there is some type of problem. If you're using Windows 7, you should try disabling Aero. If you're using Windows 8 or Windows 10, then try updating your graphics drivers, or rolling back to an earlier driver if you updated recently. In most cases, the cause behind csrss.exe using excessive resources is that you're dealing with a fake. Could Csrss.exe Be a Virus? While csrss.exe itself is a legitimate file, and an essential part of windows, the fact is that some malware and viruses sneak through with fake names. That means it's actually possible to have malware that uses the csrss.exe file name, or very slight variations of that name. If you suspect that your computer may be infected with a csrss.exe virus or malware, it's actually pretty easy to figure that out. This is due to the fact that legitimate copies of the csrss.exe file are only found in two different folders. If you find a Client Server Runtime Process in your Task Manager that points to any other folder, or to a file that isn't named csrss.exe, that means you have some type of malware or virus. New malware and viruses appear all the time, but the Nimda.E virus in particular is known to use the csrss.exe file name. Press and hold CTRL + Alt + Del, and select Open task manager. Scroll down to the Windows processes section. Tap-and-hold or right click on Client Server Runtime Process, and select Open file location. Verify that the csrss.exe process is located in your %SystemRoot%\System32 or %SystemRoot%\SysWOW64 folder. If the file is located anywhere else, or isn't named csrss.exe, you may be dealing with malware or a virus. Pay very close attention to the name of the file. If even one letter is different from csrss.exe, it's probably malware. Repeat these steps for each instance of Client Server Runtime Process that you see in your Task Manager. If you suspect that you have malware or a virus running on your computer that's disguised as an innocuous Client Server Runtime Process, the best thing to do is to scan your computer for malware. While you can safely delete a csrss.exe file if it's located outside your System32 or SysWOW64 folder, doing so may not actually remove the malware. If you do opt to delete such a file, always make sure to scan your computer afterwards with at least one free spyware or malware removal tool. In some situations, you may find that you can't delete the malicious csrss.exe file, or that you have malware that actively prevents you from running a malware removal tool. In those cases, you'll want to use a bootable antivirus tool on a flash drive or CD.